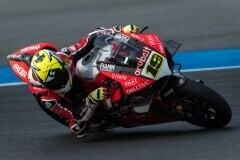 Álvaro Bautista, winner on his debut three weeks ago at Phillip Island, continues to astound at the Buriram circuit in Thailand, where he set the best time in both of Friday's free practice sessions. The 34-year-old Spanish rider, after going quickest in the morning run, then shaved another tenth of a second off his time in the warmer afternoon session to end up with a best lap of 1'32.971, three-tenths faster than his closest rival Jonathan Rea on a Kawasaki. Team-mate Chaz Davies had a bit more difficulty today after working hard in the two sessions to improve his feeling with the Panigale V4 R. Despite a couple of minor inconveniences, the 32-year-old Welshman finished the day in eleventh place on the timesheets and a best lap of 1'34.093. "For sure it's only Friday, but I'm quite happy because the most important thing was to confirm our potential on a track that is different from Australia. This morning I started to understand the track and the reference markers, which are a little bit different from the MotoGP bike, so I needed some laps to adapt my riding style. Then I just worked on the bike settings without making any big changes, just some adjustments for the set-up on this track. In the afternoon we tried a different type of rear tyre to see what the new compound was like. There were positives and negatives, so we still have to decide for the race tomorrow. The feeling with the Panigale V4 R is good and I'm satisfied with the result of this first day." "On the timesheets my position doesn't look good, but the feeling is actually better than what we managed to show today. On the last run we tried a different front tyre, but for the moment it didn't feel good. We also made a set-up change that didn't give me such a good feeling, but we're working hard and I feel like there is a margin to improve. The race is long and it's hot here, for sure we need to work hard and focus on tyre life especially towards the end of the race. Our aim is to be able to fight for the podium in the races on Saturday and Sunday."